Whether you’re here to get in some serious laps or just want to splash around with the kids on a hot Louisiana day, Ochsner Fitness Center has the pool for you. 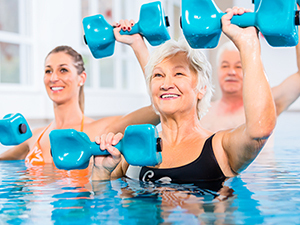 From Waterbabies to Arthritis Aquatics, the first-class aquatics facilities at Ochsner Fitness Center – Harahan allow us to offer a wide variety of programs for all ages. Choose from swim lessons and swim teams for children and adults, and a variety of group fitness aquatics classes, including Water Walking, Silver Splash and Balance and Flexibility. Our Harahan club contains indoor and outdoor lap pools, for a total of 20 lap lanes, as well as indoor and outdoor recreational pools, hot tubs and kids’ pools. For a quick, relaxing dip after your workout, you’ll also find hot tubs at our Harahan, Downtown and Heritage clubs. Heritage also has an indoor lap pool. Water aerobics classes are offered at the Harahan and Heritage locations. Check the group fitness schedule for times and locations. Award winning competitive swim teams for kids ages 5 and older.